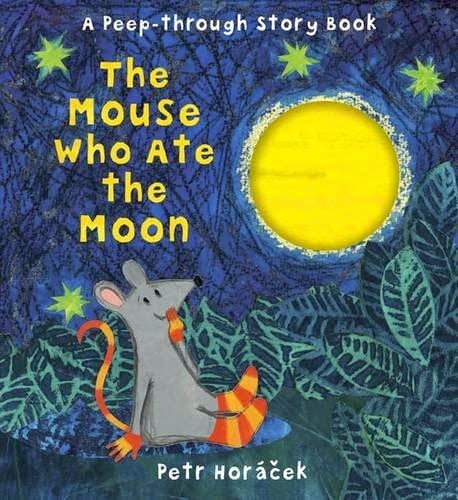 The Mouse Who Ate The Moon is a beautiful new illustrated children's picture book by Petr Horacek - author and illustrator of Holly's absolutely favourite book on the entire planet - Animal Opposites. The Mouse Who Ate The Moon is available in hardback with a cut-out hole for the moon on the front cover. Originally I had assumed that the cut-out would be restricted to the cover but in fact, lots of the pages within the book feature peep-through holes, cut-out shapes or shaped pages. I think this is great for Holly, my youngest, to explore and for Lara who is more engaged with the story, the peep-through holes act as a good way of building the suspense for the next page. The story is of a little mouse who dreams about the wonder of the moon. One day the little mouse finds a tasty treat outside her house and can't resist a nibble. But then she panics - she has eaten a piece of the moon and it will never be round again! Little mouse looks to her friends for help but thankfully, in the end, everything turns out alright and the moon rises full and intact again! Holly was already a big fan of Petr's illustrative style and I think this book really shows it off well. Big bright (but not garish) colours, hand-drawn stylised animals and beautiful backgrounds using all sorts of different media (lots of the leaves and landscapes look like they were achieved with wax-resist. There is something very magical about the moon and if your child hasn't yet discovered the wonder of the moon then I think this book would definitely spark that interest. I have read this book at bedtimes to both of my girls (2 and very very nearly 5) and I think it would be suitable upto about 6 years old for young readers.